carved in half-profile and foreshortened on one side to allow for both full face and profile viewing, with softly contoured high cheeks, half-closed eyes and small features conveying a devout, respectful expression, the visage covered with white gesso, the hair and high court headdress painted in black. 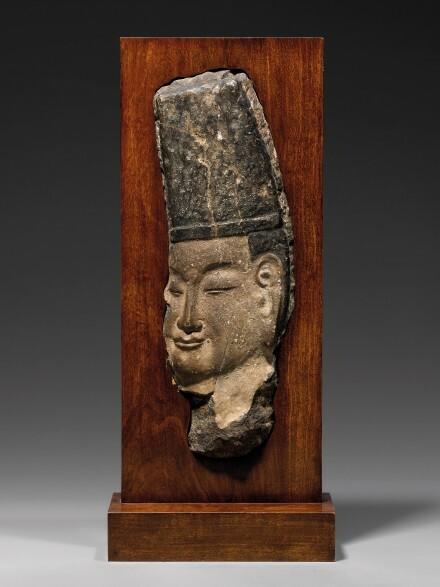 Compare the similar limestone relief head of a dignitary in the Rietberg Museum, illustrated by Sirén, Chinese Sculptures in the von der Heydt Collection, Zurich, 1959, pp. 66-67, no. 18. The Longmen Buddhist cave-temples carved into the rock palisades along the banks of the Yi river, south of the city of Luoyang in Henan province, is one of the most famous ancient Buddhist sites in China. The carving of Buddhist shrines at Longmen was greatly supported by the later Northern Wei emperors, particularly in the early part of the 6th century, after the emperor Xiaowen (r. 471-499) moved the capital to Luoyang in 494. The style, proportions, and pose of the present carving indicate that it may have been part of one of the large reliefs flanking the entrance to the Binyang cave at Longmen. The reliefs in the Binyang caves represented ceremonial processions of high-ranking members of the imperial court led by the emperor Xiaowen and his mother, the empress dowager Wenzhou. The greater part of these reliefs are now reconstituted and displayed in the Metropolitan Museum of Art in New York and the Nelson-Atkins Museum of Art in Kansas City. This sculpture of an imperial court official is not a portrait of a particular individual; it is the depiction of an ideal figure seeking spiritual enlightenment. The sublime attitude of a follower of the Buddha and the elegant demeanor of a high court official are here combined in one image.